Perpetuate, create, share and wear beautiful fresh Kauai flower & foliage haku leis for your head or hat. Custom made from all natural materials in the wili-style of lei making. 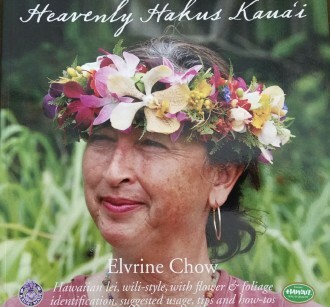 Take a class & make your own haku; purchase the book "Heavely Haku's Kaua'i" by author and Lei maker Elvrine Chow. Demonstrations done at the KCC Sat. Market, Wed. Culinary Market, The Shops @ Kukui'ula, and Kealia Farm Market on Mon & Fri. Classes held at Kauai Museum, Kealia Farm & Orchid Alley.